How do I know if my dry cleaner is a green dry cleaner? In all the counties of the San Francisco Bay Area there is a governing body for green businesses call the Bay Area Green Business Program. The green business program in these counties will only certify a dry cleaner if they are using one of two dry cleaning systems. The first and most popular of these systems is the Wet Clean system that uses water, a natural soap and a conditioner to clean dry clean only garments. The second is the CO2 system that uses CO2 compressed to approximately eight hundred pounds to create a liquid, that liquid is then used along with a soap to clean the garments. All other dry clean systems using an array of solvents (Perchloroethylene, Tetrachloroethylene, Hydrocarbon, Solvair, DrySolv, PureDry, EcoSolv, Shell Sol140HT, Stoddard or Rynex to name the popular ones) that are not considered green nor non toxic by this or any other government agencies. 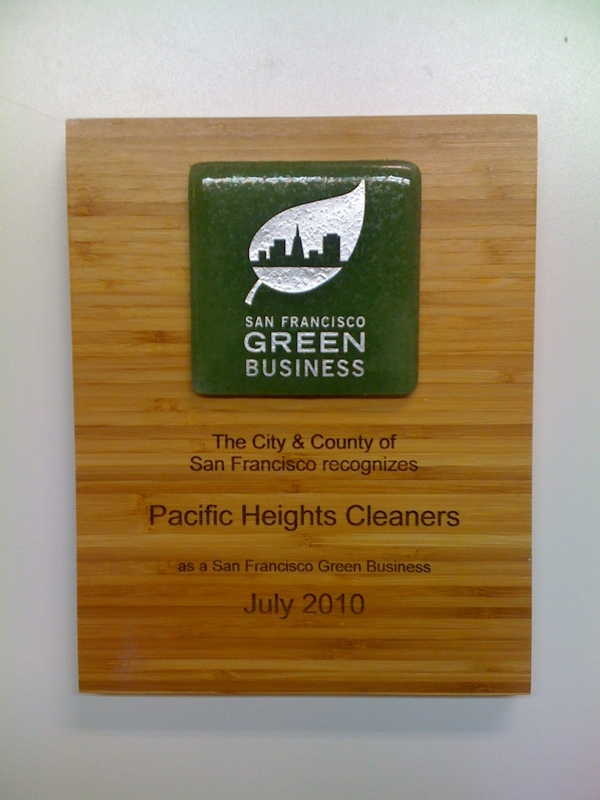 We are fortunate to have the Bay Area Green Business Program in Northern California as they are currently the only government agency that has a certification program for dry cleaners in California. The goal of this agency in creating a green certification for dry cleaners to encourage dry cleaners to eliminate the use of hazardous dry cleaning solvents and encourage them use a non toxic alternative. 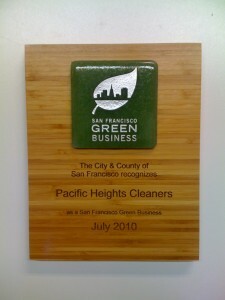 San Francisco’s division of the Bay Area Green Business Program call the San Francisco Department of Environment leads all the other counties with the most stringent requirements for a dry cleaner to become green certified. Requiring the uses of a non toxic dry cleaning system is only the first steps of becoming green certified in San Francisco, they also require the use of specific spotting agents that are safe for your health and the health of our planet. They have issued a report call how to green your cleaning, in this report they give specific health issues related to each of the four most commonly used dry cleaning systems (Perchloroethylene, GreenEarth, Hydrocarbon, Wet Clean). 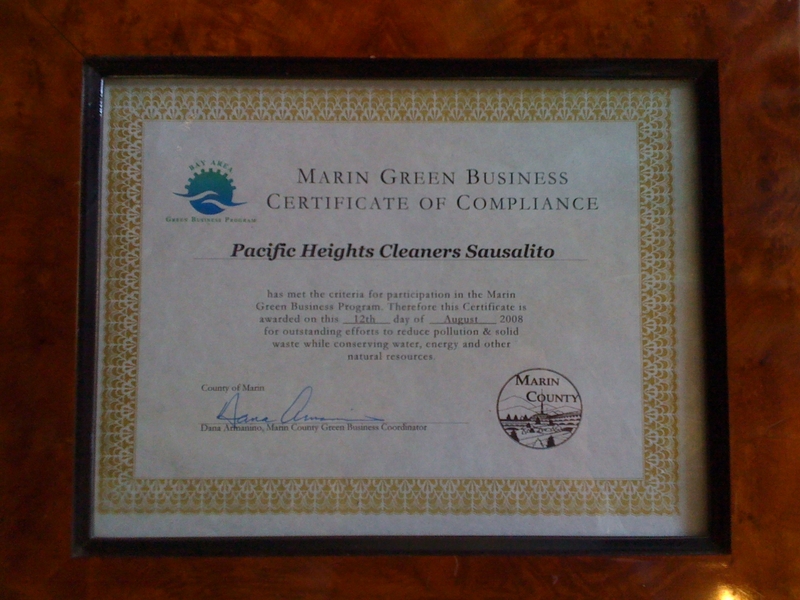 We are proud to have become the first certified green dry cleaner in Marin County in August of 2008, and now I am proud to say that as of July 2010 we are the first certified green dry cleaner in San Francisco, City & County. This is a small step in our overall goal of changing our industry to be a better and safer place to do business. 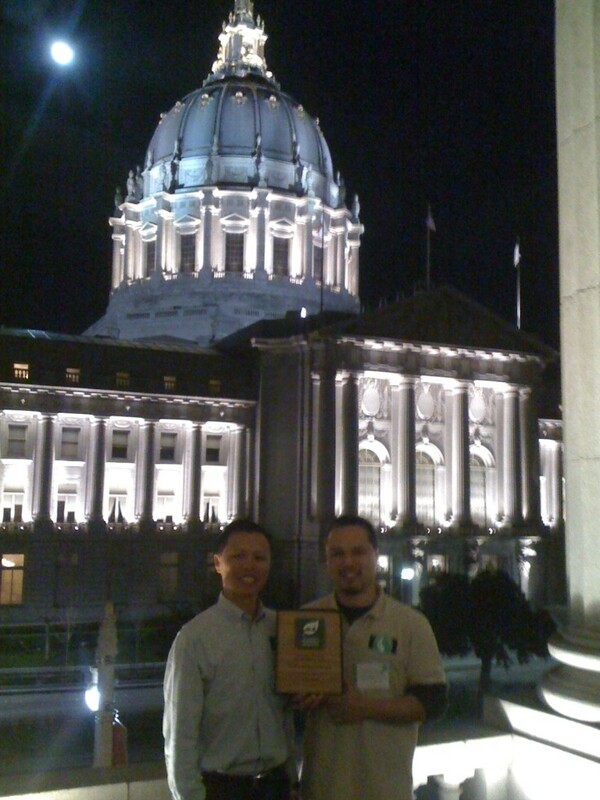 We received our certificates at the San Francisco Department of Environments Award reception along with fifty other San Francisco business at the War Memorial building across from City Hall. Pacific Heights Cleaners in San Francisco and Sausalito is your non toxic alternative to solvent dry cleaning, proudly leading the way in garment care today and into a healthy future. Marin and San Francisco’s 1st Certified Green Dry Cleaner using an eco dry clean non toxic system that is safe for your health and the health of the environment. How to Remove Red Wine from Cotton Khaki Pants. Accessories Are The Finishing Touch How to remove an Oil Stain from a Cotton Drape.